Excerpted from Eve Crawford Peyton’s blog, Joie d’Eve, which appears each Friday on MyNewOrleans.com. Most nights, my kids are at least served a healthy meal, even if they don’t always eat it. While Georgia is still in her buttered carbs phase, Ruby and Elliot will happily eat broccoli, greens, sautéed zucchini, sweet potatoes, green beans, chick peas, cucumber salad, and even Brussels sprouts. But right now is not “most nights.” Right now is Carnival time, baby. And so my kids are eating Rice Krispy treats, Goldfish, Voodoo Zapp’s, and juice boxes. They’re eating pizza rolls off a paper plate while we’re stuck in traffic. For protein, they get peanut butter granola bars, and the closest they’re going to get to a vegetable until Wednesday is maybe a carrot on a veggie tray at an open house. 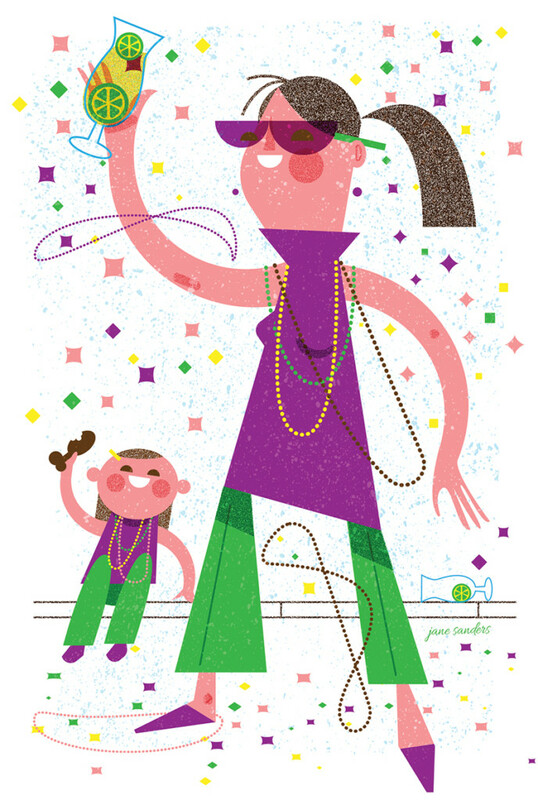 The food groups of Mardi Gras are different, and everyone knows that Carnival calories don’t count. So what’s fueling us during this marathon party? Well, anything that keeps well (no mayonnaise-based salads, people, now or really any other time) and is portable is pretty ideal. 1. Boudin balls. These are one of my top snack foods, even not during Mardi Gras. My favorites are from Boucherie, but I’ve had good ones from Tracey’s and McClure’s, too. 2. Daiquiris. Now these, I definitely don’t drink year-round. I like the occasional eggnog daq around the holidays, but beyond that, these are only good at a parade. Several locations will sometimes even offer a virgin daiquiri for the kids, but not all, as I learned once when then-3-year-old Ruby had an absolute sobbing meltdown and cried herself to sleep in her car seat repeating, “I WANT A DAIQUIRI! I WANT A DAIQUIRI, MAMA! I WANT A DAIQUIRI!” Having your kid cry in a drive-thru daiquiri line is really something that only happens here. 3. Carnival cupcakes. I make these for the kids’ classes every year and often bring them to parade potlucks. The recipe is simple (because more time spent baking cupcakes is less time spent catching beads): Two boxes of white cake mix, mixed according to directions and then divided into three bowls and dyed purple, green, and gold. Put 1 tablespoon of each color into each cupcake wrapper, bake for the time indicated on the box, frost with cinnamon buttercream (3 sticks of butter, softened; 1.5 teaspoons of vanilla, 1.5 tablespoons of cinnamon, one box of powdered sugar, and 4 tablespoons of milk), and top with a king cake baby. 5. Popeyes. This one is obvious. Although a spicy dark meat combo with mashed potatoes, red beans, and a biscuit is good on just a random lazy Saturday, it’s sublime on the parade route. Just like the sea air makes sandwiches and lemonade taste better, something about the sound of marching bands and your feet on the neutral ground makes Popeyes the most perfect food imaginable.